My grandmother died whilst I was finishing my final engineering exams at Ardmore in November 1967. I visited the funeral home in Hamilton East but did not go to the service. Her last years had been peaceful at Tokonui Hospital near Te Awamutu; but before that dementia and old age drove Mum and my uncle Doug to despair. Although the asthma which had haunted her for years seemed no longer to be an issue, she often confused me for Doug, asked if I had finished milking, and had a tendency to dissapear up the road towards the Mormon Temple from Dinsdale in West Hamilton where Mum was living in the 1960s. I also have happier memories - of haymaking and blackberry picking on the farm in Whakahongi Road and morning teas spread out beside the hay. I remember her stories from the Depression when dodgy relatives arrived by taxi without any money expecting food and accommodation. There are her letters in my mother's papers from when we were in England in 1957, and occasional insights into life on Whakahongi Road from the scraps of information I continue to discover: her pattern book for dress-making, the receipe book of her mother, post-cards from her brothers Donald and John in France during the War (Donald was a miner in Waihi and a Tunneller in Arras), a letter to a cousin in Clinton and a rare visit to the South Island. My feet can easily find their way to her grave in Te Aroha - a link with someone who showed me a level of understanding which surprised me as an adolescent and still does. The old house at the farm seems so much smaller as a hay-barn than it still looms in my imagination from the 1950s and 60s where every room remains vivid in its character and detail. The steps from the porch which caught the morning sun, the path to the outside loo, and the washhouse where a flush toilet was installed and the copper removed. Doug's endless supply of war stories like Reach for the Sky and The Great Escape. The hundreds of preserving jars under the tankstand. The family dining table in the sun-porch perpetually covered in newspapers. The crank-handle, party-line, telephone on the wall in the kitchen, the bathroom off the lounge whose taps gave you an electric shock, the fireplace where Doug got fires going by holding a newspaper across it to get a draught and sometimes the paper itself caught. The mantlepiece which held endless rubber bands, bits of string and brown paper, and a life-time collection of things that might be useful, one day. You never knew. It was not the first house that Mary and Ernest had lived in. Also still standing is a two-roomed shed now on poles. I always knew it was where my grandparent's had first lived. Mary and Ernest married in the Registrar's Office in Morrinsville 3 March 1920. They took a month's holiday travelled to the South Island and stayed in Clinton with Ernie's sister Florence and visited his brother Sydney who had kept the family name German during World War I whereas Ernie and others took their mother's name of Matthews. In Dunedin they admired the begonia's in the Botanic Gardens and visited Sydney and Edith's daughter Evered then a boarding pupil at St Hilda's College. 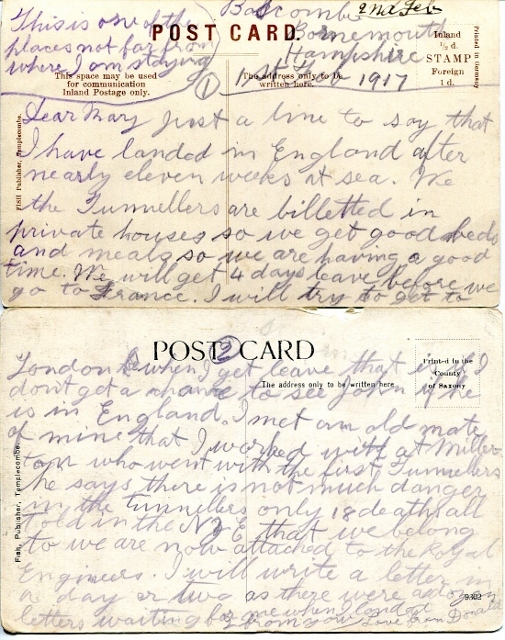 At the end of May 1920 Mary wrote to Edith that Evered (14) "seemed so happy" and that she did not think "the training or life at the school will spoil Evered or cause her to become proud." "Ernie is very busy getting the farm in order and as there is a great deal to be done he works fairly hard. Our house timber has not come along yet so we are comfortably settled in our little two rooms for the winter. There is something really nice about a wee place though, and of course less work to be done"
Mary became pregnant almost immediately and my mother Cathie was born on the 9th of February 1921. She had a still-born boy in May 1923 and then Doug a year later on 26 May 1924. Feeding hens was a life-long love and as Ernest and Mary got the farm going in 1920 they were essential. "I have a few hens and ducks but get no eggs at all although I feed them very well. Eggs have never been so scarce up here that I remember. We have only one little cow in milk but she gives more than we can use of milk and butter and of course Devonshire cream." My grandmother valued education - encouraging my mother and later me in our academic studies - and often lamented she had had so little, but she knew how to write well and she was a reader. She often quoted Burns "my love is like a red red rose." Old copies of the National Geographic were around the house along with the Auckland Weekly News. The Australian Post with its suggestive cartoons was something I found in other people's houses. Mary also read the King James Bible, which was of course the bible of her generation, and she somehow got involved with a Cooneyite group meeting on a nearby farm. I was interested to discover later that her grandfather Alex's bible brought out from Scotland still survived, that for a time he had attended a Bretheren church in the Rangitikei, and that the Robertsons had contributed to the building of the Presbyterian Church in Ngarua. She had also been keen to marry off my not yet divorced mother to the Presbyterian minister in Morrinsville. When Doug and Ellen were married in November 1959 at least running the house was shared, but it was not easy for any of them. Sometimes Mary went to stay with Cathie in Hamilton, but it was increasing impossible to leave her alone. Mary's going to Tokanui Mental Hospital appeared as the only solution - yet it proved much more satisfactory than might have been imagined. Doug's words to me that it was just like dealing with any other illness were helpful. Mary appeared surprisingly content. She died peacefully on 3 November 1967.